The Zen master Ling Chi said that the miracle is not to walk on burning charcoal or in the thin air or on the water; the miracle is just to walk on earth. You breathe in. You become aware of the fact that you are alive. You are still alive and you are walking on this beautiful planet. That is already performing a miracle. The greatest of all miracles is to be alive. We have to awaken ourselves to the truth that we are here, alive. We are here making steps on this beautiful planet. This is already performing a miracle. But we have to be here in order for the miracle to be possible. We have to bring ourselves back to the here and the now. Therefore each step we take becomes a miracle. If you are able to walk like that, each step will be very nourishing and healing. You walk as if you kiss the earth with your feet, as if you massage the earth with your feet. There is a lot of love in that practice of walking meditation. I see that life is a miracle. I keep my mind clear like a calm river. Ling Ching was very wise. His simple wisdom teaches us that being alive IS a miracle, that this planet IS beautiful, and that awakening and walking in this beauty is also a miracle. 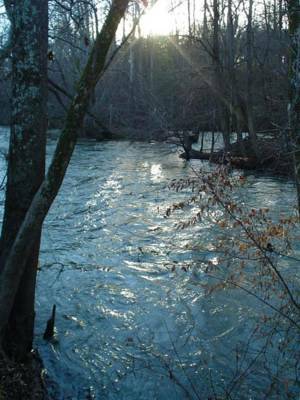 Your beautiful photo of the Catawba River shows the wonderful glassy and shimmery quality of water. Water is a lovely metaphor for unity, for changes, and for moment to moment living. Mindful of this beauty, we do awaken and rest in the miracle around and within us, each moment, as another wise and compassionate one, TNH, teaches. Thank you for this. I printed this post out and taped it to my desk at work to inspire me throughout the day.